Do you have low energy in the afternoon? Do you wake up feeling tired, have troubles focusing and also lack drive, concentration and motivation? Today my friend Jeff from Coastal Acupuncture and Wellness is here to help. Jeff is a Registered Acupuncturist and has been in practice since 2000. He is a licensed member of the College of Traditional Chinese Medicine Practitioners and Acupuncturists of BC. If you have low energy in the afternoon you may have a kidney imbalance. According to the concepts of Traditional Chinese Medicine or TCM, we have a flow of qi or energy that goes to and from internal organs. When that flow is blocked, stagnant, or deficient we will develop pain, or other symptoms. Fatigue and low energy can be a sign of deficient or stagnant kidney energy. The kidneys in TCM are both organs and system. They are responsible for maintaining water metabolism throughout the body, filtering toxins from the blood, and they store our “root energy.” The root energy is our most basic energy that we acquire from our parents, and accumulate with our lifestyle. The kidneys are like a savings account where you store energy to save for the future. If you keep dipping into the “savings” account you will become depleted over time. You can use acupuncture, herbs, qi gong and yoga combined with the TCM horary clock to help your kidney energy. The horary clock suggests that there is an ideal time to strengthen an organ that is deficient or weak. 3pm to 7pm is the time of the kidneys. Coincidentally, this is also the time that we get the mid afternoon slump. If you can organize your schedule to practice qi gong at this time for even 5 minutes it will help increase your energy in the moment and it will also fundamentally shift your kidney qi. 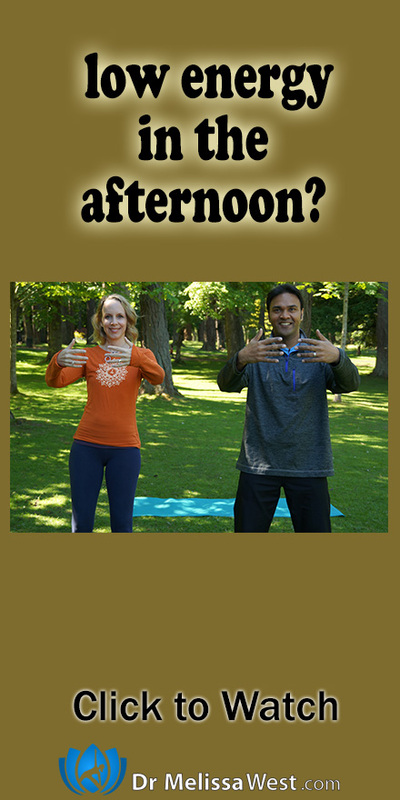 Today Jeff and I are going to share with you a yoga pose with an acupressure point that you can practice to nourish your kidney meridians. When you hold this pose for five minutes you will be coaxing energy into your meridians and helping to draw energy into your kidney organs. Why would you want to bring energy to your kidney meridians and kidney organs? Well according to traditional chinese medicine, your kidneys are the storage tanks of your body. They gather the surplus of energy in your body and store it to be used when needed. Your kidneys are responsible for storing your energy which is exactly what you are supposed to be doing during the winter months in preparation for the outburst of energy in spring. When you work overtime, are stressed and push on even though you are exhausted it is your kidneys that are responsible for stepping up the energy. However they cannot do this continually. Over time, you will burn out. This yoga practice will focus on stimulating your kidney meridian and bringing balance to this energetic channel in your body. If you are suffering from low energy and feeling chronically fatigued, I would highly recommend seeing traditional Chinese medicine doctor or registered acupuncturist. With a personal consultation they can take your pulse and look at your tongue and treat you specifically with acupuncture and herbs. And if you would like a handy downloadable Traditional Chinese Medicine clock that shows you not only when to beware of low energy, but also some other important times of day related to health problems you may be experiencing then click below. Today’s question for the comments is: What yoga do you do to support your energy balance?